Cardigan Golf Club01239 621775work Golf - 18 holeCardigan Golf Club is one of the most startling of the unsung courses of Wales and is to be found high on a hill overlooking the Teifi Estuary at Gwbert, 2 miles from Cardigan. Furman Bisher of the Atlanta Journal, doyen of American golf writers once said "with the possible exception of Pebble Beach, the view from the top of the Cardigan course is the finest I've seen anywhere in golf". With undulating fairways, boldly contoured greens and strategically placed bunkers the course provides an excellent test for all levels of golfers. It has hosted several Welsh Golfing Union Championships and international matches. Magnificent stretches of gorse are a feature of the course and come into play on 15 holes. Situated on gently sloping soil the course is playable all year round. The finishing holes through bracken and gorse are particularly enjoyable and the short 16th is worth framing. 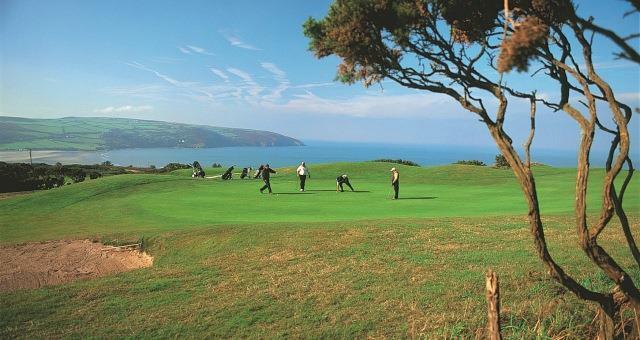 Cardigan is a truly majestic test of golf against a backdrop of breathtaking scenery. The modern clubhouse provides panoramic sea views and includes 3 squash courts alongside its other superb facilities, ensuring Cardigan is one of the finest golf complexes on the west coast of Wales.